Well. It’s here. 18 weeks of training and my victory lap is happening on Sunday. I am SO excited to run the Chicago Marathon and even more so now that I’ve arrived in Chicago. As I write this, it’s Tuesday evening and I just got into town today for work. I’ve been thinking a lot about my goals and about this training cycle in general. I’ve had a number of folks ask about my Chicago Marathon race goals so I thought I’d put it all in one place. Before I delve into race goals, I want to also acknowledge that this is technically a Friday Five post. I’m kind of switching it up because I have three race goals not five, but #IdowhatIwant, right? I also wanted to announce that after over three years of the Friday Five and just about three years collaborating with Mar and Cynthia, we will be ending the Friday Five linkup after next Friday – the 14th. I have loved this linkup. I started it solo because a linkup seemed cool – I really didn’t know what I was doing. Then I sought out partners and found friends in Cynthia and Mar. I have met so many cool and interesting bloggers through this linkup and it has been one of my favorite things about blogging. However, as things shift and change in life and on the blog, we all realized it was time for a change. I have enjoyed the regularity of a Friday Five post each week but I’m also looking forward to the freedom of being able to do something different. I love blogging (even though I do so less these days) and have no plans to stop. But taking stock of my goals for this hobby of mine sounds about right – and a part of that is saying goodbye to the Friday Five. Thank you to each of you who ever linked up and I hope you’ll join us this week and next as we say goodbye to the Friday Five. In the spirit of this community – please feel free to link up with whatever topic you choose over the next two weeks. Now – on to the good stuff! 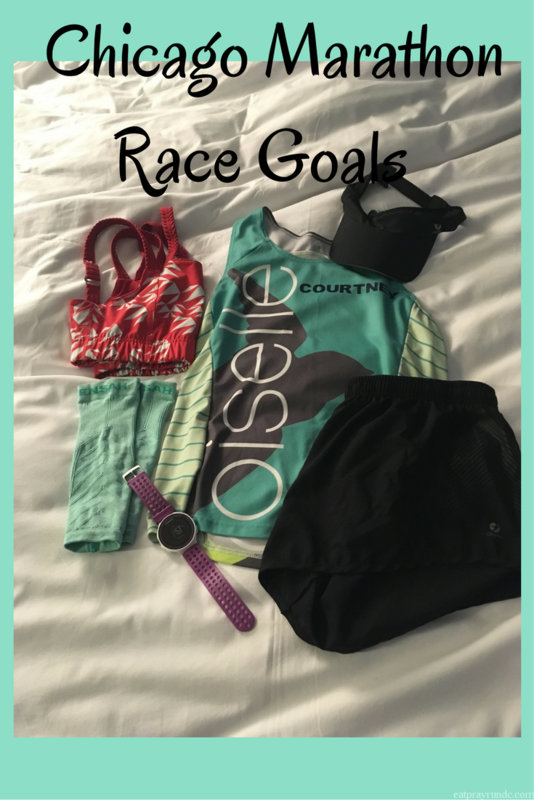 My Chicago Marathon Race Goals!!! I like to set three goals for big races – A, B and C. My A goal is my perfect day goal. My B goal is an average day – what I’d expect to run. My C goal is not a great day and something may have gone wrong. A Goal: 4:10. This is about a 9:30 pace and I think I am trained well to run this pace. I’m really optimistic about the race and about my goal. This is a really scary goal not because I’m not trained for it – I am – but because this would be a 41 minute PR! I am believing I can do this and excited to see what race day brings! B Goal: 4:15. This equals out to a 9:44 pace and was my original goal when I began training. I switched to a 4:10 goal because I was consistently running my tempo runs at about a 9:20-9:30 pace and felt like a 9:30 pace goal was in line with my fitness. If I ran a 4:15, I would be thrilled. That would still represent a HUGE PR and I’d be proud of myself. C Goal: 4:30. I will be severely disappointed if I run slower than 4:30 – only because I’m trained to run much faster than that and I’ve worked so hard over the past few months. 4:30 would still be a 21 minute PR so if I didn’t have a great day, I’d be able to handle running 4:30. Spectating the race? The picture above is my outfit for race day so look out for me! Does everyone set 3 goals before a race? I love doing so! I really don’t want to do a marathon, but if I did Chicago would be near the top of my list. It is such a fun place to run. Any marathon goal that involves a sub-10 pace amazes me, but I know you’re training has gone so well. YOU’VE GOT THIS! I am so glad I got to know you through the Friday Five. We’ll have to make more plans for more meet-ups. I am running Chicago on Sunday and my goal is to help my friend run a sub 4:45. The second goal is to finish:) No third goal this time. Awesome – I hope your friends exceeds their goal!! Good luck with your goals and your Chicago Marathon, Courtney! It’s been fun following your training and agree you are ready for it! I love that even your C goal entails a big PR and that says a lot about how much you’ve grown as a runner and with your training. Can’t wait to read about Chicago, your race recap, and how you feel about Hansons post race (I am still on the fence for a marathon, but I’m a believer in the half plans, as I’ve used those but don’t regularly run marathons). Best wishes on Sunday!! I know you are not totally on board for another marathon but I have total confidence you would have a great experience based on your training! You totally have this one!! You have been working so hard! And Chicago is a great race for a PR. I can’t wait to hear about it. I am sad to hear about the end of Friday Five but I totally understand the amount of work you guys put into it. I’ve loved having the opportunity to link up and “meet” you, Cynthia and Mar. Good luck this weekend! I know you will rock it. Sad to see Friday Five go, but I totally understand. I’m sure you will have lots of good stuff to read on the blog still. Best of luck to you as you run Chicago! Look for lacey, she’ll be there. Thank you so much for starting the Friday 5. You’ve actually made me keep myself on track and accountable with this whole blogging thing. I m sad to see the link up go. Great goals! You will do awesome! Your training has gone well. The weather is looking good and I see you reaching your A goal! Good luck! Hope to see you in Chicago! Thanks Sherry! Hope to see you this weekend! Have a fantastic race! You’ve worked hard and now it is time to celebrate. I love how you term it a victory lap! I will be running my second marathon this Sunday. Good luck on Sunday – have an amazing race! Have a great time in Chicago! And I wish you the best on the course – you deserve your A goal as you trained hard for it. Thanks for hosting the link-up. It’s been fun connecting with like-minded bloggers. Great goals post and so sad but totally understand about the Friday Five. Let’s do this, lady! Your A goal is definitely within reach! You got this! I hope you plan to be at the RMHC tent race morning 🙂 it’s absolutely worth it! Yes – I will be there both before and after the race! Hope we will meet up at some point this weekend. Thanks so much for providing the Friday Fuve lineup. We enjoyed being part of that while we were blogging regularly. Your goals for Sunday seem well thought out and I hope you have a great race. Whatever the results, you have worked so hard this training cycle and improved so much as a runner. Have a wonderful victory lap! Yes – I hope to see you. Maybe Saturday morning? Good luck Pam!! Courtney! I’m so excited for you! You’ve had an awesome training cycle and I so admire your dedication to such a challenging plan. Big congrats, you have grown so much as a runner and your training has been on point. I will be stalking you on Sunday and cheering from my couch in Atlanta! Thanks Jess! I’m pretty excited and appreciate the support! I am so excited for you–your training has been spot on and I would be surprised if you don’t meet your A goal on Sunday! Ok, and now that you’ve made your announcement about ending the Friday Five, I swear I had no idea about that when I wrote my post. Goosebumps. And I’m sorry to see the linkup go–it’s been fun and a great way to connect with other bloggers! Ha – that is so ironic. Thanks for the support 🙂 see ya Sunday! Thank you for hosting the Friday Five. It’s a great linkup and I’m sad to see it ending. But I know life happens and we have other obligations. Thanks for a lot of fun! And more importantly, have a GREAT racein Chi town! I’m so excited for you! Those are awesome goals. You’ll do great! How exciting! It’s been fun to watch your excitement as you’ve trained and you seem very ready and happy. I do like how you have 3 goals and can’t wait to hear how you crush them. Have a wonderful race! How great is it that even your C goal would be a huge PR! Almost a minute off your previous pace is amazing, and I know you’re trained well beyond that so I have high hopes that you will meet and exceed your goals. Best of luck on Sunday! I hope no matter what happens you have a strong, happy victory lap celebrating all the hard work you’ve put in! So excited for you! I can’t wait to hear all about how you made your A goal! I just know you’re going to do great! I’m doing my long run Sunday so will be thinking of you! You can totally hit your A goal! You’ve put in SO much hard work during this training cycle.I hope you have a great marathon experience this weekend! …and thank you so much for the Friday Five link up. I’ve been able to connect with many amazing bloggers through this link up, but totally understand that you feel it’s time to move on and try something new! I will miss the Friday Five. Thanks for keeping it up for so long. Good luck on your marathon. Your goals are amazing. Even goal C would a great achievement. Good luck this weekend, Courtney. I’ll be cheering you on! I know that you’ve trained really hard for the past 18 weeks. Sunday will be your time to shine. Thanks to you, Mar, and Cynthia for hosting the linkup. I’ve thoroughly enjoyed being able to participate over the past 3 years and have gotten to meet and connect with so many other bloggers through your linkup. Thanks for all of the time and work that you all have put into the linkup. Good luck! I’ve very much enjoyed Friday Five, even when I couldn’t come up with topics 🙂 It’s been a lot of fun, and I found Pure Barre and Oiselle from your write ups. Thanks! GO GET IT! You’re training has been awesome. Trust your training and run smart. The start of Chicago can be super fast, so take some deep breaths and make sure you don’t start faster than your A goal pace. It’s SO flat and fast and the crowd is amazing. I’ll be at Mile 13 on your right with Marcia and will look for you! Are you in Wave 1? Have an amazing run! I’m sad about the Friday 5 but totally understand. It can be tough to be obligated when you have so much going on! Your training has been so strong! You’re going to crush it! Have fun in Chicago and good luck! YAY good luck!! You got this!! I just started stalking the weather for my trip to Chicago on Tuesday and noticed that it looks like you guys will have great racing weather! Here’s hoping that helps you reach your A-Goal. You’re well trained and the weather’s going to be cooperating – sure seems like it could be your day! Good luck! Best of luck @ Chicago… it has been fun watching you train for it. You’ve got this! Good luck in Chicago!!! You will rock!! It’s here it’s here!!! I’m so excited for you — You’ve put the work in, now go out there and ENJOY!!!! LIKE RUNNING A 4:15 MARATHON! You have it in you. Go get it! I will be cheering for you. Good luck! Head up, wings out! I am sure you will fly right by me, but I will be thinking of you. I hope you accomplish everything you set out to do. BEST of luck to you!!!!!! Head up, wings (way) out!!! I am so excited for you! No matter what, I’m sure you’ll be amazing tomorrow! Even your C goal is a huge PR! Way to go! Love your race outfit and have an amazing time – Chicago is such a special race. I know you’ll hit your goals. I usually just set two goals – what I want to run and then just surviving 🙂 That way I know I’ll get at least one of my goals! Can’t wait to hear how it goes. GOOD LUCK! Can’t wait to read how it went. I have been checking IG all day waiting to see ! You trained so hard, I hope you had an A race ! I’m looking forward to your recap of this race…congratulations on your PR! I’m also sad to hear about the ending of Friday 5…it’s how I was introduced to your blog! Thanks for all the fun times!